One thing that happens to cymbals as you use them over a certain period of time, is that they get dirty. When we say dirty, we mean dust that sticks to them, along with various other kinds of unwanted staining. A decent majority of drummers pays no special attention to this, even though they should. When a cymbal gets dirty, the added weight and impromptu coating change its tone. It goes dark. Cleaning and polishing the cymbals is the only way to restore their factory sound. Today, we are going to show you what we think are the best cymbal cleaners you can get. We chose those products which got the job done and didn’t damage the cymbal in the process. Let’s get started with the rundown. This is a very unusual-looking cleaner that has an equally unusual name. However, it has been the choice for many drummers in the business. When you want to get the job done on the go, this solution is what you want to have in your gig bag. In terms of price to volume, it’s a bit on the expensive side. However, it is definitely worth the money. This 4-ounce bottle contains a solution that was carefully synthesized to provide best results when applied to bare metal cymbals. It quickly works through the dirt and grime that you have collected over time, but it also removes oxidation. One of the great things about the Lizard Spit MP03 is the fact that it’s a polish as well—likely the best cymbal polish, in fact. This means that you can clean and protect your cymbals in one swoop. Once you apply the MP03, you have coated your cymbal with a thin protective film that makes them preserve that sweet polish longer and effectively reduces the risk of oxidation. Groove Juice is a bit of a niche cymbal-cleaning solution, but that is what makes it so great. This product has been on the market for a while now, and it has successfully passed all the trials it was put on by a variety of drummers. What truly sets it apart is the way you use it. Groove Juice comes in an 8-ounce bottle with a spray nozzle on top. That alone could probably hint a few things about this product. 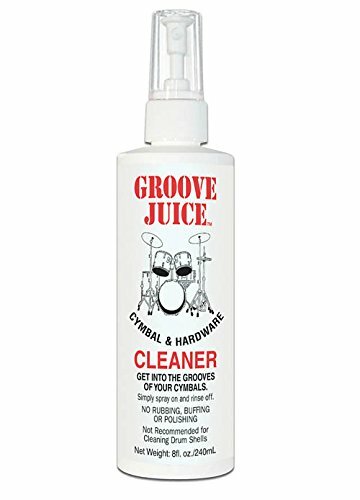 When you want to apply the Groove Juice to your cymbals, simply spray it on in a way that covers the entire surface, and let it sit for some 30 seconds. Once that time is up, rinse the cymbal under warm water, and dry with a new rag. This thing removes just about everything. It gets into grooves, and simply eradicates the dirt from the surface of the cymbal. It’s actually so strong that it can easily remove the logos, so be careful with that. 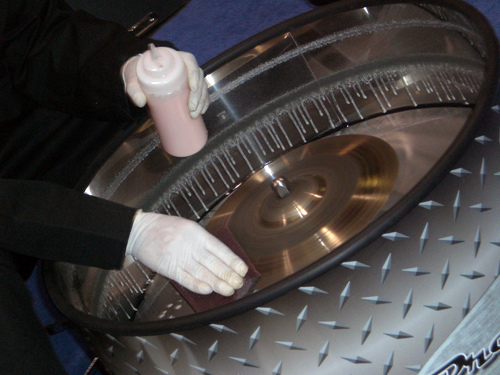 With that limitation in mind, you can be assured this is among the best cymbal cleaners period. Aside from giving us some of the best cymbals on the market, Zildjian also has a very fine line of care products that are great for cymbal maintenance. The one we are talking about today is a perfect example. 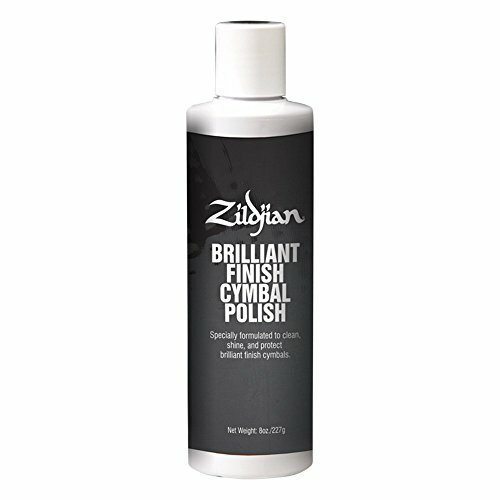 The Zildjian Cymbal Cleaning Polish is meant to be used with brilliant finish cymbals only and works pretty well for that application. This quite inexpensive 8-ounce bottle contains a pretty potent formula that works some serious magic on dirty cymbals. Even if you have heavy oxidation on your set, Zildjian Cymbal Cleaning Polish restore them all back to mint condition. It works great on just about any design of cymbals, including grooved ones. All you have to do is apply it and use some elbow grease to work the dirt out. This should be on anyone’s list of the best cymbal polishes on the market. Just like Zildjian, Paiste also has their own concoction that promises to bring your cymbals back into their glorious factory shape. On a grand scale of things, this cleaning product could be a bit expensive, but it also comes with 12 ounces of cleaning solution, so it all balances out in the end. 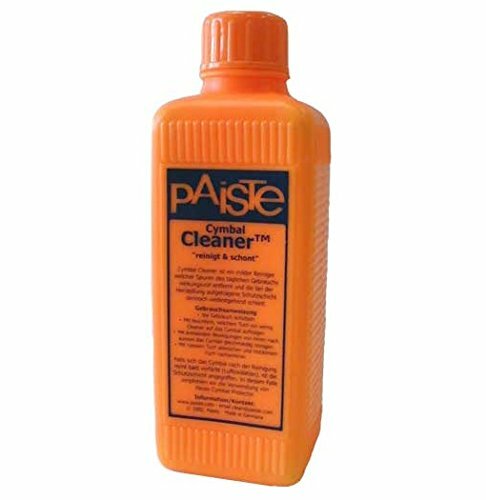 There is nothing easy or romantic about this Paiste cymbal cleaner. It comes in a bottle that could have easily been used for cheap off-brand brake fluid, and it requires a decent amount of work to apply correctly. With that said, once you are done with it, you will be amazed at just how good it actually works. Before applying the solution, wash your cymbals with warm water. Dry them up and get some of the cleaner onto the surface. Use a toothbrush or other type of plastic brush and start working on that polish. Your arms are probably going to be exhausted by the time you’re done, but the results are well worth the effort. If you want a wholesale package of great cymbal cleaner, this Paiste product is perfect for you. Conclusion – How to Chose the Best Cymbal Cleaner? All of the cymbal cleaning fluids we’ve presented you with do an awesome job at taking care of your shiny babies. Some are more expensive than others, and some require a bit more work that the others. As you can see, the factors that make the best cymbal cleaner are pretty clear: you need a product that gets the job done efficiently while not damaging the goods and doing so at an affordable price. At the end of the day, it all depends on how keen you are to keeping those cymbals in a nice, polished state. No matter which one you choose from these models we’ve shown you, the results are going to be more than satisfying. Make your cymbals shiny again. They deserve it. Songsimian.com is a participant in the Amazon Services LLC Associates Program, an affiliate advertising program designed to provide a means for sites to earn advertising fees by advertising and linking to amazon.com.